I just love when our CSA pick up includes sunflowers. I almost always put them in this pitcher because it’s sturdy enough to hold them but also because I think it just look so old-fashioned and perfect. I’ve got some fun stuff planned for this weekend, including Fiber Revival on Saturday – woot! I’m really looking forward to spinning and shopping and catching up with all of my awesome fiber-y friends. Sunflowers are a crop around here. Nothing like looking at a sea of them! And I still marvel at how they manage to turn toward the sun. Happy Weekend! 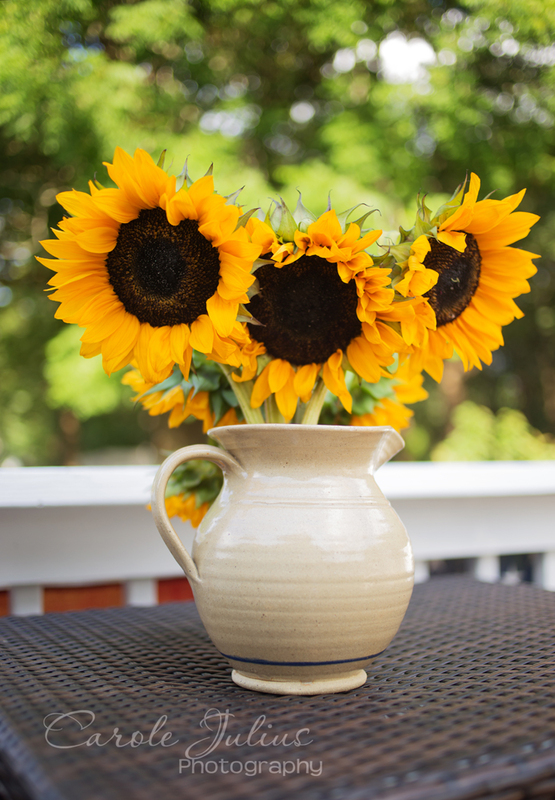 Your sunflowers look like the perfect way to further enjoy summer. Happy Weekend! Our garden is full of sunflowers and I love photographing them (and the bees who visit). A pitcher full is a fun idea! Oh no (re Fiber Revival)! I didn’t get a notice from Julia this year, and this weekend in Rockport is already so busy. The local Historical Society is doing a big show of Folly Cove Design including early prints and the original woodcuts–plus there’s a Lobster Fest and fireworks. Fiber Revival doesn’t stand a chance this year, but have a wonderful day there. I mean of course that Fiber Revival doesn’t stand a chance of my attending NOT anything more dire! The pitcher indeed is the perfect compliment for the sunflowers. Enjoy your finery weekend!